Dabbawalla kindly sent us an example of their wonderful bag and I am very pleased to share with you my very favorable impression. Their name sounded familiar, so to satisfy my curiosity I managed to find this from the Dabbawalla site. "Literally translated it means lunch box carrier. We are inspired by the legendary system of dabbawallas delivering homemade lunches, packed with love, to thousands of office workers in India." It is a colorful and wonderful way for you and me to send lunches with our children. 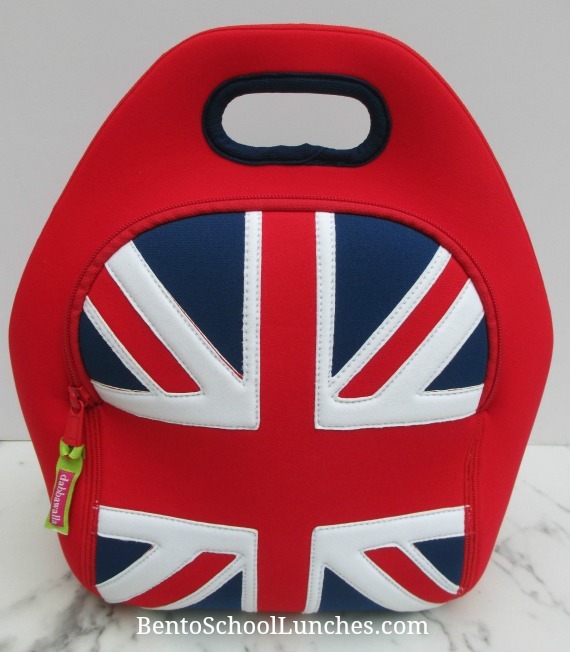 The British Union Jack lunch bag shown here is the one which Nikolai had chosen. 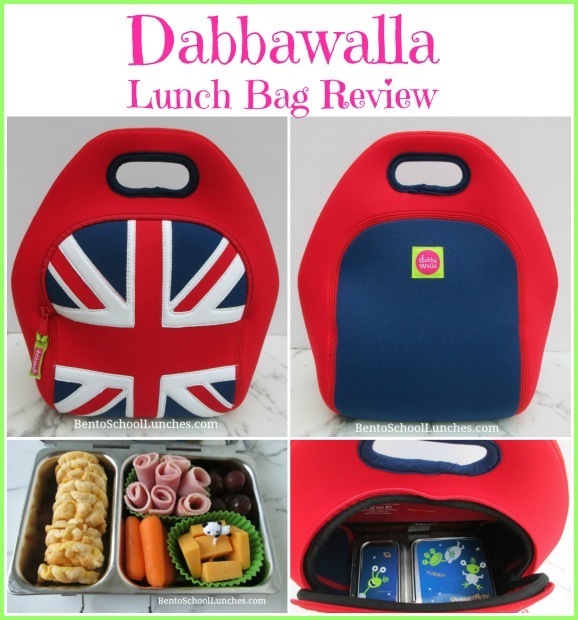 This Dabbawalla Lunch Bag is just one from the great selection which you can find at their site. Their colors are eye popping bright and their designs are both numerous and cheerful. Dabbawalla is an absolutely phenomenal brand that is known for its trendy designs and its amazing neoprene-like fabric called eco-sponge. 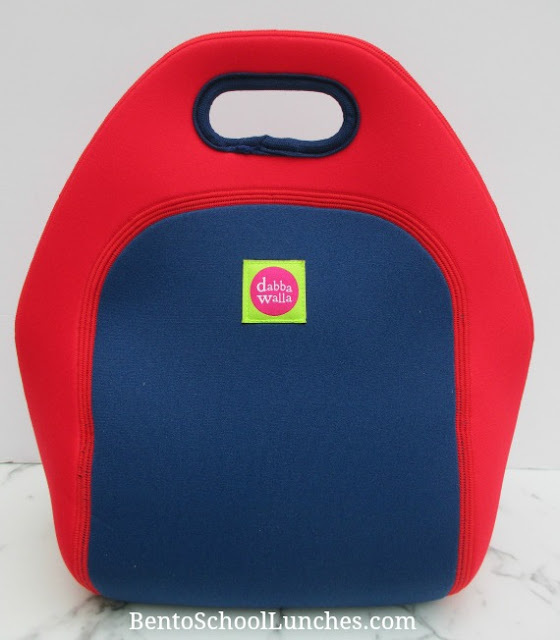 Not only is the PVC-free material eco-friendly, it’s also insulating so your child’s lunch stays colder typically for four to five hours if you include an ice pack. The Dabbawalla bags are easy for even very young children to open and close to access their lunch, and the handle is soft and comfortable. While quite roomy inside, they are not bulky outside. It's not as small as some of the ones I've seen sold in stores, this is quite a good size bag which I absolutely like! I have tried it with many lunch boxes from my collection and found that it will easily accommodate many types of containers. The photo above shows the back side. The inside usable dimensions are 10 inches high x 9 inches wide x 6 inches deep, but these are a bit variable as their bags are soft and expand a bit to fit many containers. I am very pleased with how much I could fit into this roomy lunch bag, it was able to hold Nikolai's lunchbox, an ice pack, his water bottle and still have room to spare! 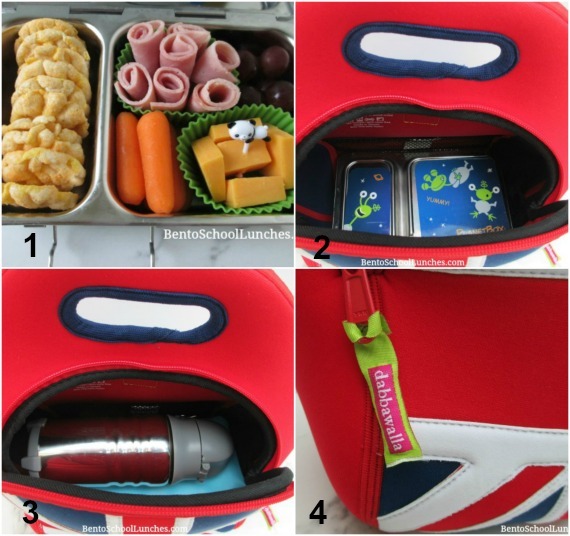 The lunch box can even stay UPRIGHT, a feature that I truly love! Below you can see that there is even a mesh pocket inside for an ice pack or napkins and one on the side for a water bottle or utensils. Homemade lunchables with nitrate free ham roll-ups, organic baby carrots, seedless grapes, cheese chunks with a cute pick and rice crisps which was packed in a PlanetBox Shuttle. The Shuttle lunchbox is positioned upright in the bottom of the Dabbawalla bag. Room to spare even after adding an ice pack and a PlanetBox BottleRocket. The adorable zipper pull which is easy for children to use and which I truly adore. How cute is that! I LOVE this lunch bag and only wish that I've found the Dabbawalla site when Nikolai was much younger. I like all of their super duper cute and functional bags! Disclosure: Dabbawalla generously provided me with the product for review without cost to me. Other than receiving the product, I have not received any compensation to write this review. All opinions are my own. The lunchbag is so cute, my kids would love it! Right on time to get some new lunchbags!